In the 75th year since Danfoss invented the first thermostatic radiator valve, commonly referred to as a TRV, the company’s Marketing Manager, Gareth Ash, charts the development of this popular energy saving product into a new generation of intelligent heating controls that meet the latest regulations. Published in 2018, a report from the European Building Automation Controls Association (EUBAC) based on statistics from the European Environment Agency offers an in-depth study into energy use and heating costs in EU homes, including millions of dwellings across the UK. The report found that 26 million UK homes are heated with a ‘wet’ central heating system, which is among the highest in the EU. Typically, these systems consist of a centralised boiler circulating heated water to radiators in each room. EUBAC’s report also showed that 66% of these dwellings have TRVs but almost a quarter of these are older, less effective manual radiator valves (MRV), while nearly 9 million homes have radiators with no TRVs – creating wasted energy and money for householders. The lack of modern heating controls in many homes has now been addressed with targeted amendments to the Energy Performance of Buildings Directive (EPBD). Among the requirements under the new, revised EPBD is the fitting of devices that regulate temperature at room level, such as TRVs. The Directive states that, subject to being technically and economically feasible, the installation of this type of self-regulating device should be considered for the separate regulation of the temperature in each room or, where justified, in a designated heated zone of the building unit. This latest requirement is clearly a positive step towards improving the energy efficiency of millions of homes, bringing the benefits of lower heating bills, as well as higher levels of comfort and wellbeing for occupants. The fact that the Directive recognises the energy saving value of low cost, short payback solutions like TRVs is good news for the industry and end-users. Properly selected and installed, TRVs are proven to provide accurate temperature control in individual rooms, reducing heating costs and enhancing comfort for consumers. They are also quick and easy to fit in new or retrofit installations, which is an advantage for installers and their customers. Whilst new legislation supports the fitting of TRVs it is important to understand that not all TRVs offer the same level of accuracy and efficiency. For example, the type of material used in the TRV’s sensor, usually either wax or liquid, can make a big difference to performance. Needless to say, a lighter liquid filling will expand and contract more quickly than a heavier material like wax – resulting in a faster response to any change in temperature. Also, the crystalline composition of wax tends to get harder and heavier with constant expansion and contraction, causing a detrimental effect on the TRV’s performance. In addition to this consideration, we appreciate that price is likely to be a factor when purchasing TRVs. However, the lowest cost option could be a false economy as such products may use inferior quality components. This could compromise their overall performance and durability, leaving the installer with an unhappy customer and a costly call-back. Since Danfoss introduced the first TRV back in 1943 there have been many new developments in TRV design and technology. These include devices with a flow selectable, bi-directional design, which allows the TRV to be installed horizontally or vertically, in flow or return. 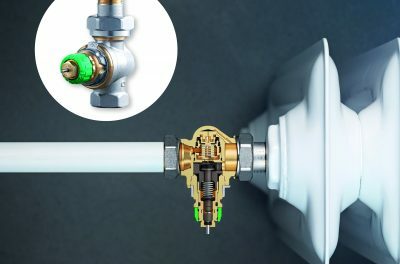 This innovative solution resolves the age-old problem of ‘water hammer’ – if any system noise occurs after fitting it can be stopped by simply ‘revolving’ the barrel to reverse the flow direction. Other developments in this field include TRVs that combine a thermostatic radiator valve and a differential pressure controller. Ideally suited to residential buildings, this type of 2-in-1 valve design provides accurate temperature control and automatic hydronic balance in a single product – reducing potential problems with uneven heating and high energy costs. To commission the system for optimal efficiency the valves just have to be set to correct maximum flow at each radiator. In addition to advances in valve design, some of the latest TRVs offer programmable control of individual radiators for even greater flexibility and heating efficiency. Clever and convenient, these intuitive devices make it simple for homeowners to take in-home control of individual radiators using an App on their smartphone with Bluetooth technology. The TRV has certainly come a long way in 75 years and is now smarter than you may think. Today’s TRVs are packed with practical and intelligent features to make them even easier to install and to use. With this new generation of products installers have an ideal opportunity to provide their customers with a compliant control that delivers some of the key benefits of smart heating and all for a relatively low investment cost.